Earlier this week I felt like having a healthy bite, something I could throw together quickly over lunch due to a crazy work schedule. The Greek yoghurt I found in our fridge looked like the way to go – now how healthy Greek yoghurt exactly is, may be debatable but it sounded mighty healthy to me and at the same time has got a great taste, too. Being the more adventurous or daring of the two of us, there sure are times I wish I had chosen something more conventional, but then I’d also miss out on great insights, like this one: adding the seeds of a pomegranate and a bit of the juice together with a few chopped pistachios (need to find out where I can get Pistacchi di Bronte here in Munich), turned out to be a simple but delicious enhancement both visually as well as taste wise. 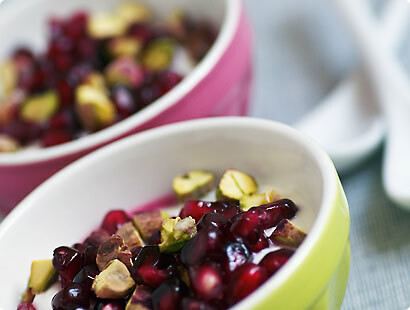 The crunchiness of the seeds goes well with the pistachios’ and the pomegranate juice gives it a refreshing note. And besides, I was happy using once again Brett’s proven method for dealing with a rebellious pomegranate. What gorgeous colors! An thanks for pointing me to Brett’s post, I always had problems handling pomegranates. I’ll try it soon! Oh, this sounds not only healthy but delicious as well. I like the pistachio part. My favorite! Another coincidence here :) the very combination of pomegranate and pistachio happens to be my favorite of the time, one that I have been playing around with in sweets. Aren't they looking (and tasting) just gorgeous together? Hi Chika, I agree, I think they are a wonderful match. I had it again and tried it with a bit of vanilla honey - delicious. the french women don't get fat writer claims greek yoghurt is one of her secrets! in any case, your concoction looks incredible. Looks really nice and quick to make. I must start being more adventurous with my low-fat yoghurt shopping! I never knew it was so special. Two words: Gorgeous images and awesome blog!!!!! So happy that I found you! I love pomegranates so much I have to eat them with an apron on since I squirt and splatter the juice all over me as I am eating them. Great photos once again brava/bravo. Greek yogurt is such a wonderful thing. Beautiful picture! Looks pretty good, though I would replace the yoghurt with some vanilla ice cream. I know that defeats the object, but hey, what you gonna do. Love your blog! As a fellow foodie and art historian I'm blown away by the gorgeous presentations in addition to the delectable palatte. I've been going crazy with pomegranates this winter. I love a combo of the seeds with diced mango. Put the seeds, sliced strawberries, and chocolate chips and almond slivers over raspberry sorbet. But my absolute new favorite is this recipe I'll paste in--sorry for hogging the space, but everyone loves it--not every ingredient has to be included, but the dressing is crucial (dressing from Cooking Light--the rest I augmented). My produce woman told me this technique for seeding the pomegranate--the trick being not to cut through the seeds, less messy. I like to toss the spinach only with the poppy seed dressing, then add the rest of the ingredients on top in individual portions. Process first 5 ingredients for 30 seconds in a blender. With blender running, pour oil through food chute in a slow, steady stream, and process until smooth. Stir in poppy seeds. Keeps for weeks in the fridge. With a paring knife cut out central top section and bottom in a circle—trying not to pierce any seeds. Score the flesh into eight sections—peel apart—separate seeds from membranes. PS–I use olive oil, not vegetable oil in the dressing. Wow. the colors. the ingredients. looks and sounds delicious. definitely on my to-try list. thanks for sharing.